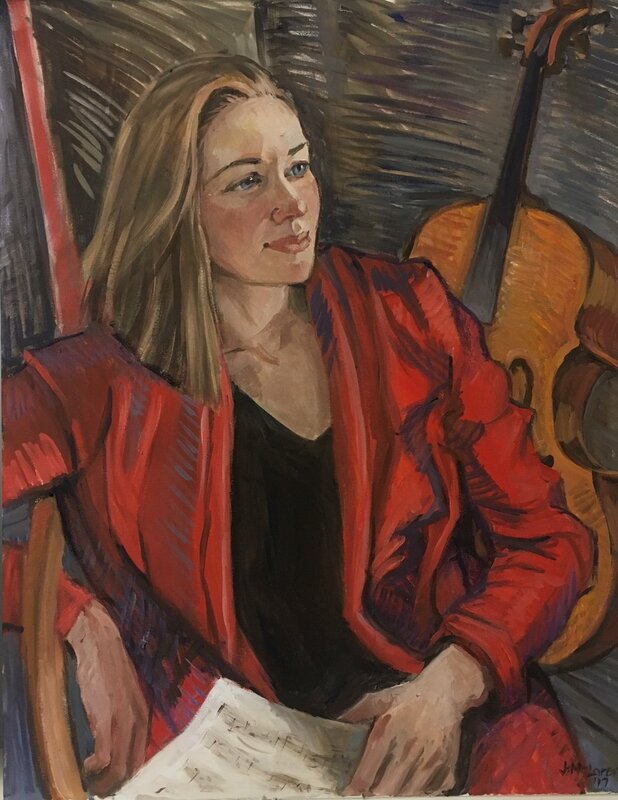 Portrait of Rosanna Butterfield, oil on canvas, 22x28 - She wanted to be portrayed playing her beloved cello, Grandmother (who commissioned it) did not - so a compromise!!! 'Tender' 30X30 - oil on canvas. I love the patterning of the shadows and the wonderful colour contrast between the warm yellows and oranges with the purples and blues - and, of course, the light and dark. 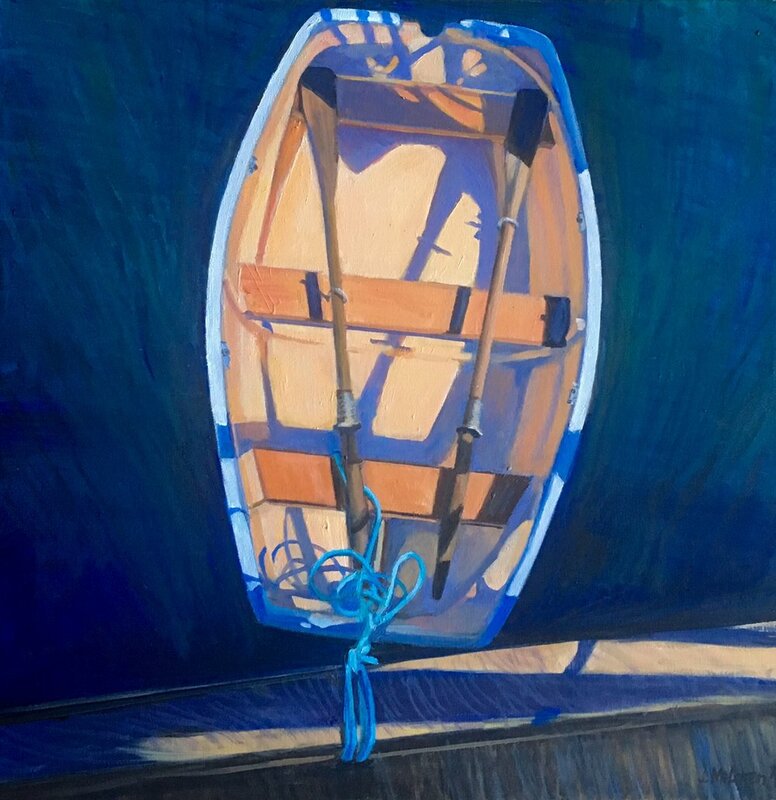 What appears at first to be a static image has much tension in it because of the two strong angles of the boat and of the dock.The powerful inverted triangle of the oarswhich contrast with the wonderful curves of the boat and of the shadows cast on its surface are anchored by the cerulean blue line which brings a strong vertical to the composition. This is one of several attempts I have made recently to design to the square - always a challenge. The reference was taken at the Cowichan Bay Marina - a lovely morning boating over to enjoy coffee and treats across the strait. Another in my series of people at the seashore. These two sisters -with dog- are testing out the temperature! A vignette from Fisherman's Wharf in Victoria. I think the smokey skies of the summer make an appearance in this painting! Early stage of portrait painting at the TD Art Gallery Paint-In yesterday. Thousands of people attended. It was fun to catch up with old friends and meet new ones. A new seascape, "Wave", oil on canvas, 30 X 40, that will be part of my display at the Moss Street Paint-In. Looking forward to Saturday when I will be painting a portrait of my son's beautiful girlfriend. Drop by if you are in the area, will be located on Moss Street just below Richardson between 11 and 4 on July 15. 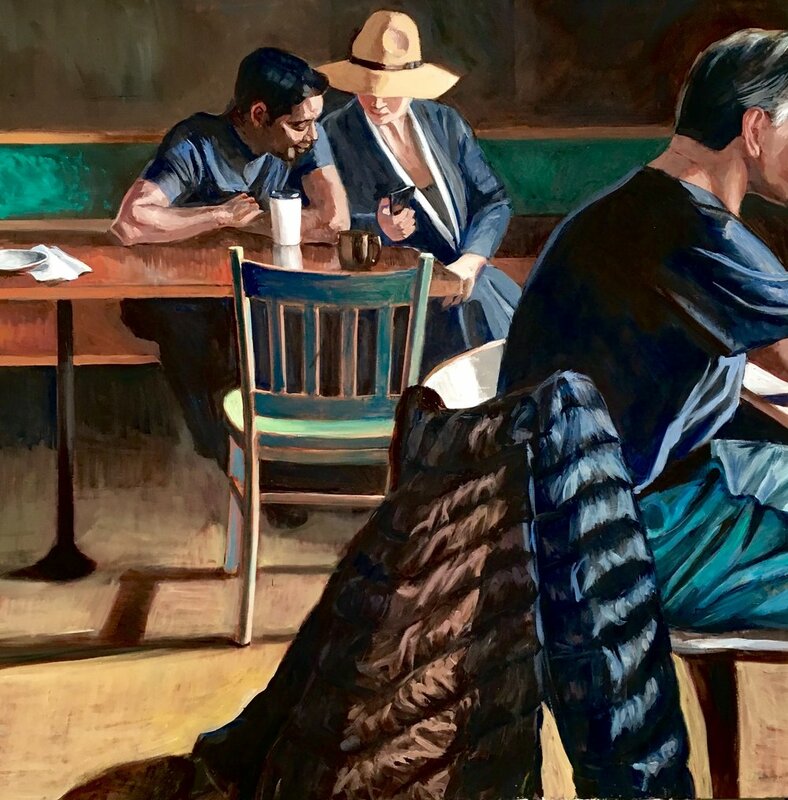 Another in my coffee shop series, dealing with intimacy and isolation. The title is an appropriate one, given the number of times the woman is wrapped - by her scarves, her sweater, her arm, the hand around her face and most of all by the fact she is wrapped in thought. The paper she was reading and the glasses have been discarded to allow her to devote her mind entirely inward. The fellow behind her is a foil - engaged and active - which emphasizes further her stillness and solitude. The curves in the composition - the tire of the car seen through the window, the tables and the back of the man's head - reinforce the curve of her head as she looks down. Although they are very much apart, the two figures are connected by the lines of their hands and by the diagonal line of the window. Oil on canvas, 20" x 24"
This painting, entitled "Connection", is an unusual composition for me as it is painted on a square. Derived from a scene in my favourite coffee shop, it's about isolation and intimacy - light and dark, flat shapes and rendered form. The eye must journey through barriers of stripes to see the story of the scene, which takes up a very small area of the painting. oil on canvas, 36"x 36"
Celebrating my new website!! This is my first post. A very recent work - oil on canvas, 30"x 36"